Weary of the barbarities of Mary’s reign, the people looked with hope and gladness to the new Sovereign. The nation seemed to wake from a horrible dream. Queen Elizabeth was twenty-five years of age when she rode through the streets of London, from the Tower to Westminster Abbey, to be crowned. Her hair was red, and her’ nose something too long and sharp for a woman’s. She was not beautiful, but she was well enough, and looked all the better for coming after the gloomy Mary. She was well educated, clever, but cunning and deceitful, and inherited much of her father’s violent temper. She began her reign with the great advantage of having a very wise and careful minister, Sir William Cecil, whom she afterwards made Lord Burleigh. The coronation was a great success; and, on the next day, one of the courtiers presented a petition to the new Queen, praying that as it was the custom to release some prisoners on such occasions, she would have the goodness to release the four Evangelists, Matthew, Mark, Luke, and John, and also the Apostle Saint Paul, who had been for some time shut up in a strange language so that the people could not get at them. The Queen replied that it would be better first to inquire of themselves whether they desired to be released or not, and a great public discussion — a sort of religious tournament — was appointed to take place between certain champions of the two religions, in Westminster Abbey. It was soon made pretty clear, that for people to benefit by what they repeat or read, it is rather necessary they should under­stand something about it. Accordingly, a Church Service in plain English was settled, and other laws and regulations were made, completely establishing the great work of the Reformation. The Romish bishops were not harshly dealt with, and the Queen’s ministers were both prudent and merciful. The one great trouble of this reign was Mary Stuart, Queen of Scots. She was the daughter of the Queen Regent of Scotland, Mary of Guise. She had been married, when a mere child, to the Dauphin, the son and heir of the King of France. The Pope, who pretended that no one could rightfully wear the crown of England without his gracious permission, was strongly opposed to Elizabeth, who had not asked for the said gracious permission. And as Mary Queen of Scots would have inherited the English crown in right of her birth, supposing the English Parliament not to have altered the succession, the Pope and most of his followers maintained that Mary was the rightful Queen of England, and Elizabeth the wrongful Queen. As Mary was so closely connected with France, and France was jealous of England, there was far greater danger in this than there would have been if she had had no alliance with that great power. And when her young husband, on the death of his father, became Francis the Second, King of France, the matter grew very serious. The young royal couple called themselves King and Queen of England, and the Pope was on their side. Now, the reformed religion, under the guidance of a stern and powerful preacher, named John Knox, and other such men, had been making progress in Scotland. It was still a half-savage country, where there was a great deal of murdering and rioting continually going on; and the Reformers, instead of reforming those evils as they should have done, went to work in the ferocious old Scottish spirit, laying churches and chapels waste, pulling down pictures and altars, and knocking about the friars. This harsh spirit of the Scottish reformers put up the blood of the Romish French court, and caused France to send troops over to Scotland, with the hope of setting the friars on their legs again; of conquering that country first, and England afterwards; and so crushing the Reformation all to pieces. The Scottish Reformers, who had formed a great league which they called The Congregation of the Lord, secretly represented to Elizabeth that, if the reformed religion got the worst of it with them, it would be likely to get the worst of it in England too. Thus, Elizabeth, though she had a high notion of the rights of Kings and Queens to do anything they liked, sent an army to Scotland to support the Reformers, who were in arms against their sovereign. All these proceedings led to a treaty of peace at Edinburgh, under which the French consented to depart from the kingdom. By a separate treaty, Mary and her young husband renounced their assumed title of King and Queen of England. But this treaty they never fulfilled. Soon the young French King died, leaving Mary a young widow. She was then invited by her Scottish subjects to return home and reign over them. She was not happy in France after her husband’s death, so she left for Scotland. When that fair young princess came to Scotland, and settled in the palace of Holyrood in Edinburgh, she found herself among strangers and wild uncomfortable customs, which were very different from her experiences in the court of France. Among the people who were not disposed to love her, she found the powerful leaders of the Reformed Church, who were bitter upon her amusements, however innocent, and denounced music and dancing as works of the devil. John Knox himself often lectured her, violently and angrily, and did much to make her life unhappy. All these reasons confirmed her old attachment to the Romish religion, and caused her to give a solemn pledge to the heads of the Romish Church that if she ever succeeded to the English crown, she would set up that religion again. In reading her unhappy history, you must always remember this; and also that during her whole life she was constantly put forward against the Queen, in some form or other, by the Romish party. Elizabeth was not inclined to like her. She was very vain and jealous, and had an extraordinary dislike to people being married. She treated Lady Catherine Grey, sister of the beheaded Lady Jane, with such shameful severity, for her being secretly married, that she died and her husband was ruined. So, when a second marriage for Mary began to be talked about, probably Elizabeth disliked her more. Not that Elizabeth wanted suitors of her own, for they started up from Spain, Austria, Sweden, and England. Her English lover at this time, and one whom she much favoured too, was Lord Robert Dudley, Earl of Leicester — himself secretly married to Amy Robsart, the daughter of an English gentleman, whom he was strongly suspected of causing to be murdered, down at his country seat, Cumnor Hall in Berkshire, that he might be free to marry the Queen. The Queen always declared that she would never be married at all, and would live and die a Maiden Queen. Many princes proposed to marry Mary, but the English court had reasons for being jealous of them all, and even proposed as a matter of policy that she should marry that very Earl of Leicester who had aspired to be the husband of Elizabeth. At last, Lord Darnley, son of the Earl of Lennox, and himself descended from the Royal Family of Scotland, went over with Elizabeth’s consent to try his fortune at Holyrood. He could dance and play the guitar pretty well, so he gained Mary’s heart, and soon married her. Mary’s brother, the Earl, or Murray, and head of the. Protestant party in Scotland, had opposed this marriage, partly on religious grounds, and partly perhaps from personal dislike of the bridegroom. When it had taken place, Mary banished Murray for his pains; and, when he and some other nobles rose in arms to support the reformed religion, she herself, within a month of her wedding day, rode against them in armour with loaded pistols in her saddle. Driven out of Scotland, they presented themselves before Elizabeth — who called them traitors in public, and assisted them in private. Soon Mary began to hate her husband, who, in his turn, began to hate her secretary, David Rizzio, whom he believed to be her lover. He hated Rizzio to that extent, that he made a compact with Lord Ruthven and three other lords to get rid of him by murder. This wicked agreement they made in solemn secrecy upon the first of March, 1566, and on the night of Saturday the ninth, the conspirators were brought by Darnley mto a range of rooms where they knew that Mary was sitting at supper with her sister, Lady Argyle, and her secretary. Within a day or two, she gained her husband over, and prevailed him to abandon the conspirators and fly with her to Dunbar. There, he issued a proclamation, falsely denying that he had any knowledge of the late bloody business. Then they were joined by the Earl Bothwell, and some other nobles. With their help, they raised eight thousand men, returned to Edinburgh, and drove the assasins into England. Mary soon afterwards gave birth to a son — still thinking of revenge. She had a greater scorn for her husband after his late cowardice and treachery than she had had before. There is little doubt that she now began to love Bothwell instead, and to plan with him means of getting rid of Darnley. Bothwell had such power over her that he made her even pardon the assassins of Rizzio. The arrangements for the christening of the young Prince were entrusted to him, and he was one of the most important people at the ceremony, where the child was named James. Queen Elizabeth I was his godmother, though she did not present on the occasion. Bothwell within another month proposed to one of the late conspirators against Rizzio to murder Darnley; “for that it was the Queen’s mind that he should be taken away.” It is certain that on that very day she wrote to her ambassador in France, complaining of him, and yet went immediately to Glasgow, pretending to be very anxious about him, and to love him very much. If she wanted to get him in her power, she succeeded to her heart’s content; for she induced him to go back with her to Edinburgh, and to occupy, instead of the palace, a lonely house outside the city called the Kirk of Field. Here, he lived for about a week. One Sunday night, she remained with him until ten o’clock, and then left him, to go to Holyrood to be present at an entertainment given in celebration of the marriage of one of her favourite servants. At two o’clock in the morning the city was shaken by a great explosion, and the Kirk of Field was blown to atoms. Darnley’s body was found next day lying under a tree at some distance. Mary was unquestionably a party to her husband’s murder, and that was the revenge she had threatened. The Scotch people universally believed it. Voices cried out in the streets of Edinburgh in the dead of the night, for justice on the murderess. The indignation of the people knew no bounds, when Bothwell afterwards married the Queen. Such guilty unions seldom prosper. This husband and wife had lived together but a month, when they were separated forever by the successes of a band of Scotch nobles who associated against them for the protection of the young Prince, whom Bothwell would certainly have murdered, if the Earl of Mar, in whose hands the boy was, had not been firmly and honourably faithful to his trust. Before this angry power, Bothwei! fled abroad, where he died, a prisoner and mad, nine years afterwards. Mary was sent a prisoner to Lochleven Castle that stood in the midst of a lake, and could only be approached by boat. Here, Lord Lindsay made her sign her abdication, and appoint Murray Regent of Scotland. She had better have remained in the castle of Lochleven, but she could not rest there, and more than once tried to escape. The first time she had nearly succeeded, dressed in the clothes of her own washerwoman, but when she put up her hand to prevent one of the boatmen from lifting her veil, the men suspected her, seeing how white it was, and rowed her back again. A shortAtime afterwards, her fascinating manners enlisted in her cause a boy in the Castle, called the little Douglas, who, while the family were at supper, stole the keys of the great gate, went softly out with the Queen, locked the gate on the outside, and rowed her away across the lake, sinking the keys as they went along. On the opposite shore she was met by another Douglas, and rode away on horseback to Hamilton, where she raised three thousand men. Here, she issued a proclamation declaring that the abdication she had signed in her prison was illegal. Being a steady soldier, Murray pretended to treat with her, until he had collected a force about half equal to her own, and then he gave her battle. In one quarter of an hour he cut down all her hopes. She took shelter at Dundrennan Abbey, and then fled for safety to Elizabeth’s dominions. As soon as Mary Queen of Scots came to England in 1568, she wrote to Elizabeth, entreating her assistance to oblige her Scottish subjects to take her back again and obey her. But she was told in answer that she must first clear herself. Made uneasy by this condition, Mary would have gone to Spain, or to France, or would even have gone back to Scotland. But, as her doing either would have been likely to trouble England afresh, it was decided that she should be detained here. She first came to Carlisle, and, after that, was moved about from castle to castle, as was considered necessary; but she never left England again. After trying very hard to get rid of the necessity of clearing herself, Mary, advised by Lord Hemes, her best friend in England, agreed to answer the charges against her, if the Scottish noblemen who made them would attend to maintain them before such English noblemen as Elizabeth might appoint for that purpose. Accordingly, such an assembly, under the name of a conference, met, first at York, and afterwards at Hampton Court. In its presence Lord Lennox, Darnley’s father, openly charged Mary with the murder of his son. When her brother Murray produced against her a casket containing certain guilty letters aud verses which he stated to have passed between her and Bothwell, she withdrew from the inquiry. Consequently, she was then considered guilty. However, the Duke of Norfolk, an honourable but rather weak nobleman, partly because Mary was very beautiful, partly because he was ambitious, partly because he was over-persuaded by artful plotters against Elizabeth, decided to marry the Queen of Scots — though he was a little frightened by the letters in the casket. Mary expressed her approval of the idea, and the King of France and the King of Spain are supposed to have done the same. The news came to Elizabeth’s ears, who warned the Duke “to be careful what sort of pillow he was going to lay his head upon.” He made a humble reply at the time, but turned sulky soon afterwards, and, being considered dangerous, was sent to the Tower. Thus, from the moment of Mary’s coming to England she began to be the centre of plots and miseries. A rise of the Catholics in the north was the next of these, and it was only checked by many executions and much bloodshed. It was followed by a great conspiracy of the Pope and some of the Catholic sovereigns of Europe to depose Elizabeth, place Mary on the throne, and restore the unreformed religion. It is almost impossible to doubt that Mary knew and approved of this, and the Pope himself was so hot in the matter that he openly called Elizabeth the “pretended Queen” of England.. A copy of this bull got into London, and was found one morning publicly posted on the Bishop of London’s gate. Another copy was found in the chamber of a student of Lincoln’s Inn, who confessed, being put upon the rack, that he had received it from a certain John Felton, a rich gentleman who lived across the Thames, near Southwark. This John Felton, being put upon the rack too, confessed that he had posted the placard on the Bishop’s gate. For this offence he was, within four days, taken to St. Paul’s Churchyard, and there hanged and quartered. As to the Pope’s bull, it was not paid much attention to. On the very day when Felton was brought to his trial, the poor Duke of Norfolk was released. Even while he was in the Tower he corresponded with Mary, and as soon as he was out of it, he began to plot again. Being discovered in correspondence with the Pope, with a view to a rising in England which should force Elizabeth to consent to his marriage with Mary and to repeal the laws against the Catholics, he was recommitted to the Tower and brought to trial. He was found guilty, and was sentenced to the block. It is very difficult tq make out, at this distance of time, whether Elizabeth really was a humane woman, or desired to appear so, or was fearful of shedding the blood of people of great name who were popular in the country. Twice she commanded and countermanded the execution of this Duke, and it did not take place until five months after his trial. The scaffold was erected on Tower Hill, and there he died like a brave man. He refused to have his eyes bandaged, saying that he was not at all afraid of death, and he admitted the justice of his sentence, and was much regretted by the people. The Parliament, aggravated by what the Pope had done, made new and strong laws against the spreading of the Catholic religion in England, and declared it treason in anyone to say that the Queen and her successors were not the lawful sovereigns of England. Since the Reformation, there had come to be three great sects of religious people — or people who called themselves so — in England; that is to say, those who belonged to the Reformed Church, those who belonged to the Unreformed Church, and those who were called the Puritans, because they said that they wanted to have everything very pure and plain in all the Church service. These last were for the most part an uncomfortable people, who thought it highly meritorious to dress in a hideous manner, talk through their noses, and oppose all harmless enjoyments. But they were powerful too, and they were the determined enemies of the Queen of Scots. The Protestant feeling in England was further strengthened by the tremendous cruelties to which Protestants were exposed in France and in the Netherlands. Many thousands of them were put to death in those countries with every cruelty that can be imagined, and at last one of the greatest barbarities ever committed in the world took place at Paris. It is called in history, the Massacre of Saint Bartholomew, because it took place on Saint Bartholomew’s Eve, Saturday the twenty-third of August, 1572. On that day all the great leaders of the Protestants (who were called Huguenots there) were assembled together to do honour to the marriage of their chief, the young King of Navarre, with the sister of Charles IX. Charles was made to believe by his mother and other fierce Catholics about him that the Huguenots planned to murder him. So he gave secret orders that, on the tolling of a great bell, the Huguenots should be slaughtered wherever they could be found. When the bell tolled, the murderers broke forth. During all that night and the two next days, they broke into the houses, fired them, shot and stabbed the Protestants, men, women, and children. About ten thousand Protestants were killed in Paris alone; in all France four or five times that number. The massacre produced a powerful impression upon the English. They began to persecute the Catholics at about this time, and the days of bloody Queen Mary must be remembered in their excuse. The Court was not so honest as the people. It received the French ambassador, with all the lords and ladies dressed in deep mourning, and keeping a profound silence. Nevertheless, a proposal of marriage which he had made to Elizabeth only two days before the eve of Saint Bartholomew, on behalf of the Duke of Alencon, the French King’s brother, a boy of seventeen, still went on; while on the other hand the Queen secretly supplied the Huguenots with money and weapons. Elizabeth was “going” to be married pretty often for a Queen who made fine speeches about living and dying a Maiden Queen. Besides always having some English favourite or other, she held this French Duke off and on through several years. When he at last came over to England, the marriage articles were actually drawn up, and it was settled that the wedding should take place in six weeks. The Queen was then so bent upon it, that she prosecuted a poor Puritan named Stubbs, and a poor bookseller named Page, for writing and publishing a pamphlet against it. Their right hands were chopped off for this crime. But that marriage never took place after all, and the Duke went away, after nearly ten years of courtship. He died a couple of years afterwards, mourned by Elizabeth, who appears to have been really fond of him. It is not much to her credit, for he was a bad enough member of a bad family. To return to the Catholics. There arose two orders ot priests, who were very busy in England,, and who were much dreaded. These were the Jesuits (who were everywhere in all sorts of disguises), and the Seminary Priests. The people had a great horror of the first, because they taught that murder was lawful if it were done with an object of which they approved; and they had a great horror of the second, because they came to teach the old religion, and to be the successors of “Queen Mary’s priests”. The severest laws were made against them, and they were most unmercifully executed. Those who sheltered them in their houses often suffered heavily for that. However, there were many plots, both among the Jesuits, and with France, and with Scotland, and with Spain, for the destruction of Queen Elizabeth, for the placing of Mary on the throne, and for the revival of the old religion. If the English people were too ready to believe in plots, there were good reasons for it. When the massacre of Saint Bartholomew was yet fresh in their recollection, a great Protestant Dutch hero, the Prince of Orange, was shot by an assassin, who confessed that he had been trained for the purpose in a college of Jesuits. The Dutch, in this distress, offered to make Elizabeth their sovereign, but she declined the honour, and sent them a small army instead, under the command of the Earl of Leicester, who, although a capital Court favourite, was not much of a general, and did very little in Holland. At home, intelligence of plots began to thicken every day. One great plot was discovered, and it ended the career of Mary, Queen of Scots. A seminary priest named Ballard, and a Spanish soldier named Savage, set on and encouraged by certain French priests, imparted a design to Antony Babington, who had been for some time a secret agent of Mary’s — for murdering the Queen. Babington then confided the scheme to some other Catholic gentlemen who were his friends, and they joined in it heartily. They were vain weak-headed young men, ridiculously confident: two of their number kept Elizabeth’s wisest minister, Sir Francis Walsingham, acquainted with the whole project from the very beginning. Walsingham, having got full evidence against the whole band, resolved to seize them. Suspecting something wrong, they stole out of the city, one by one, and hid themselves in St. John’s Wood, and other places which really were hiding places then; but they were all taken, and all executed. Mary was obviously involved in the plot, as her letters to Babington were found. Queen Elizabeth had been warned long ago that in holding Mary alive, she held “the wolf who would devour her.” The question now was, what to do with her? The Earl of Leicester wrote a little note home from Holland, recommending to poison her.His black advice, however, was disregarded, and Mary was brought to trial at Fotheringay Castle in Northamptonshire, before a tribunal of forty, composed of both religions. There, and in the Star Chamber at Westminster, the trial lasted a fortnight. She was found guilty, and declared to have incurred the penalty of death. The Parliament approved the sentence, and prayed Elizabeth to have it executed. Then the Queen asked them to consider some means of saving Mary’s life without endangering her own. The Parliament could not find any, and did not want to do that. They supposed that all the troubles would be ended by the death of the Queen of Scots. She, feeling sure that her time was now come, wrote a letter to the Queen of England, making three entreaties; first, that she might be buried in France; secondly, that she might not be executed in secret, but before her servants and some others; thirdly, that after her death, her servants should go home with the legacies she left them. Elizabeth did not answer that letter. Elizabeth wished one thing more than Mary’s death, and that was to keep free of the blame of it. 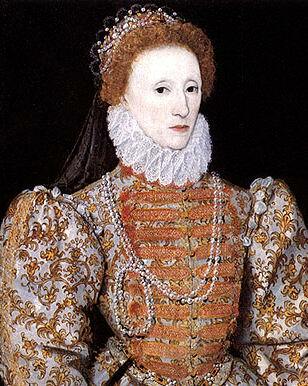 Only on the first of February, 1587, the Queen signed the warrant for the execution. So, on the seventh of February, the Earls of Kent and Shrewsbury, with the Sheriff of Northamptonshire, came with that warrant to Fotheringay, to tell the Queen of Scots to prepare for death. When the messengers were gone, Mary made a frugal supper, read over her will, went to bed, slept for some hours, and then arose and passed the remainder of the night saying prayers. In the morning she dressed herself in her best clothes. At eight o’clock the sheriff came for her. Only two of her women and four of her men were allowed to be present in the hall, where a low scaffold, only two feet from the ground, was erected and covered with black. The hall was full of people. While the sentence was being read, Mary sat upon a stool, and, when it was finished, she again denied her guilt, as she had done before. When her head and neck were uncovered by the executioners, she said that she had not been used to be undressed by such hands, or before so much company. Finally, one of her women fastened a cloth over her face, and she laid her neck upon the block. Some say her head was struck off in two blows, some say in three. When it was held up, streaming with blood, the real hair beneath the false hair she had long worn was seen to be as grey as that of a woman of seventy, though she was at that time only in her forty-sixth year. All her beauty was gone. But she was beautiful enough to her little dog, who cowered under her dress, frightened, when she went upon the scaffold, and who lay down beside her headless body after the execution. When Elizabeth knew that the sentence had been executed on the Queen of Scots, she showed the utmost grief and rage, and drove her favourites from her with indignation. James, King of Scotland, Mary’s son, also made a show of being very angry on the occasion; but he was a pensioner of England to the amount of five thousand pounds a year. He had known very little of his mother, and possibly regarded her as the murderer of his father, and he soon took it quietly. Philip, King of Spain, however, threatened to do greater things than ever had been done yet, to set up the Catholic religion and punish Protestant England. Elizabeth, hearing that he and the Prince of Parma were making great preparations for this purpose, sent out Admiral Drake (a famous navigator, who had already brought great plunder from Spain) to the port of Cadiz, where he burnt a hundred vessels full of stores. This great loss made the Spaniards put off the invasion for a year; but they still had one hundred and thirty ships, nineteen thousand soldiers, eight thousand sailors, two thousand slaves, and between two and three thousand great guns. England was making ready to resist this great force. All the men between sixteen years old and sixty, were trained and drilled; the national fleet of ships (in number only thirty-four at first) was enlarged by public contributions and by private ships, fitted out by noblemen. The city of London furnished double the number of ships and men that it was required to provide. The national spirit was up to resist the Spaniards. Some of the Queen’s advisers were for seizing the principal English Catholics, and putting them to death; but the Queen, to her honour, rejected the advice, and only confined a few of those who were the most suspected, in the fens in Lincolnshire. The majority of Catholics deserved this confidence, as they behaved most loyally, nobly, and bravely. The country waited for the coming of the proud Spanish fleet, which was called the Invincible Armada. When it came into the English Channel, sailing along in the form of a half moon, of such great size that it was seven miles broad, the English were quickly upon it, and it soon appeared that the great Armada was not invincible at all. On a summer night, bold Drake sent eight blazing fire-ships right into the midst of the Armada. The Spaniards tried to get out to sea, and so became dispersed. The English pursued them at a great advantage. A storm came on, and drove the Spaniards among rocks and shoals, and the Invincible fleet lost thirty great ships and ten thousand men, and, defeated and disgraced, sailed home again. Being afraid to go by the English Channel, it sailed all round Scotland and Ireland, some of the ships getting cast away on the coast in bad weather. So ended this great attempt to invade and conquer England. Then the Spanish king conceived the absurd idea of placing his daughter on the English throne. But the Earl of Essex, Sir Walter Raleigh, Sir Thomas Howard, and some other distinguished leaders, put to sea from Plymouth, entered the port of Cadiz once more, and got possession of the town. In obedience to the Queen’s express instructions, they behaved with great humanity; and the principal loss of the Spaniards was a vast sum of money which they had to pay for ransom. This was one of many gallant achievements on the sea, effected in this reign. Sir Walter Raleigh himself, after marrying a maid of honour and giving offence to the Maiden Queen thereby, had already sailed to South America in search of gold. The Earl of Leicester was now dead, and so was Sir Thomas Walsingham, whom Lord Burleigh was soon to follow. The principal favourite was the Earl of Essex, a favourite with the people as well as with the Queen. It was much debated at Court whether there should be peace with Spain or no, and he was very urgent for war. He also tried hard to have his own way in the appointment of a deputy to govern in Ireland. One day, while this question was in dispute, he hastily took offence, and turned his back upon the Queen. The Queen gave him a tremendous box on the ear, and told him to go to the devil. He went home instead, and did not reappear at Court for half a year or so, when he and the Queen were reconciled, though never thoroughly. From this time the fate of the Earl of Essex and that of the Queen seemed to be blended together. The Irish were still quarrelling and fighting among themselves, and he went over to Ireland, to the great joy of his enemies, who were glad to have so dangerous a rival far off Knowing that his enemies would take advantage of that circumstance to injure him with the Queen, he came home again, though against her orders. The Queen gave him her hand to kiss, but in the course of the same day she ordered him to confine himself to his room, and two or three days afterwards had him taken into custody. He was a man who could find comfort and occupation in his books, and he did so for a time. But it happened unfortunately for him, that he held a monopoly in sweet wines: which means that nobody could sell them without purchasing his permission. This right, which was only for a term, expiring, he applied to have it renewed. The Queen refused, and the angry Earl, who had been already deprived of many offices, thought himself in danger of complete ruin, and turned against the Queen, whom he called a vain old woman who had grown as crooked in her mind as she had in her figure. These words were immediately carried to the Queen, whom they did not put in a better temper. The worst object of the Earl of Essex, and some friends of his, was to obtain possession of the Queen, and oblige her by force to dismiss her ministers and change her favourites. On the seventh of February, 1601, the council suspecting this, summoned the Earl to come before them. He, pretending to be ill, declined. It was then settled among his friends, that he should make one bold effort to induce people to rise and follow him to the Palace. This attempt failed. The Earl was arrested, and brought to trial on the nineteenth of February, and found guilty. On the twenty-fifth, he was executed on Tower Hill, where he died courageously, at thirty-four years old. His enemy, Sir Walter Raleigh, stood near the scaffold all the time. In this case, as in the cases of the Duke of Norfolk and Mary Queen of Scots, the Queen had commanded, and countermanded, and again commanded, the execution. It is probable that the death of her young favourite was never off her mind afterwards. Elizabeth fell into a stupor and was supposed to be dead. She recovered her consciousness, however, and then nothing would induce her to go to bed — she said that she knew that if she did, she should never get up again. There she lay for ten days, on cushions on the floor, without any food, until the Lord Admiral got her into bed at last. When they asked her who should succeed her, she replied that her seat had been the seat of Kings, and that she would have her cousin of Scotland for her successor. This was on the twenty-third of March. At three o’clock next morning, she very quietly died, in the forty-fifth year of her reign. That reign had been a glorious one, and is made forever memorable by the distinguished men who flourished in it. Apart from the great voyagers, statesmen, and scholars, whom it produced, the names of Bacon, Spenser, and Shakespeare, will always be remembered by the civilised world. It was a great reign for discovery, for commerce, and for English enterprise and spirit in general. It was a great reign for the Protestant religion and for the Reformation which made England free.